A laminar skin simulant was constructed to study the incidence of friction blisters. The skin simulant consists of a thin polyurethane top layer and textured gum foam rubber bottom layer adhered to an acrylic-backing plate to emulate the layered structure of the human skin. Friction blisters were produced on the skin simulant by using a dual-axis tribometer. The effect of the applied normal load on the number of cycles required to produce a blister was investigated. The skin simulant was also analyzed as an adhesive-bonded laminar composite to determine the relationship between the applied normal load and the number of cycles for blistering. The normal load and the number of cycles were found to be inversely related and vary by a power law function, as observed in previous work on human subjects in Naylor’s pioneering study. 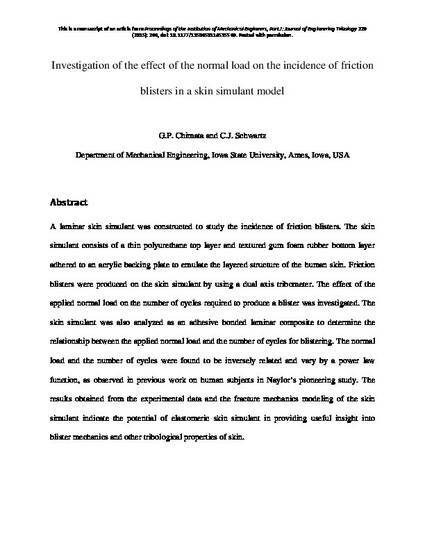 The results obtained from the experimental data and the fracture mechanics modeling of the skin simulant indicate the potential of elastomeric skin simulant in providing useful insight into blister mechanics and other tribological properties of skin. This is a manuscript of an article from Proceedings of the Institution of Mechanical Engineers, Part J: Journal of Engineering Tribology 229 (2015): 266, doi: 10.1177/1350650114535569. Posted with permission.